Book through Klook and get a free hair accessory when you participate before 10 May 2019! 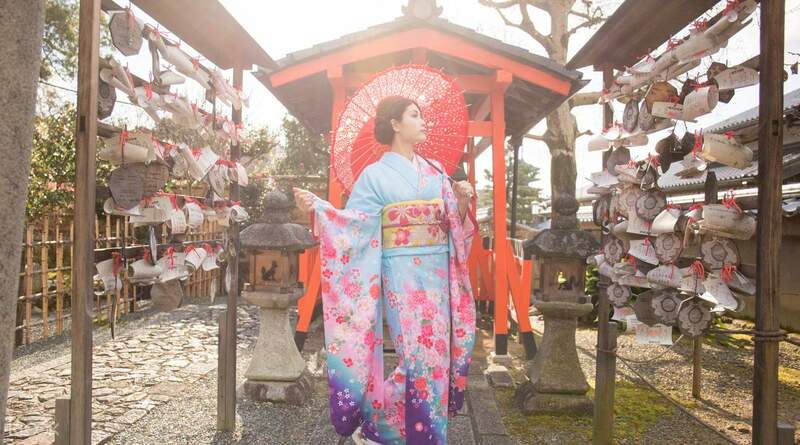 Get stunning souvenirs of your kimono rental by having professional shots done with our kimono photoshoot in Kyoto! Easy to redeem and there's a lot choices you can choose from! You can just use bus from their store to nearby attractions like Kiyomizu-dera and so on. If you are unsure on how to take the bus, you can just ask for their staff and they'll be more willing to help. Recommended to add on the hairstyle package too. Overall, it was a great experience! 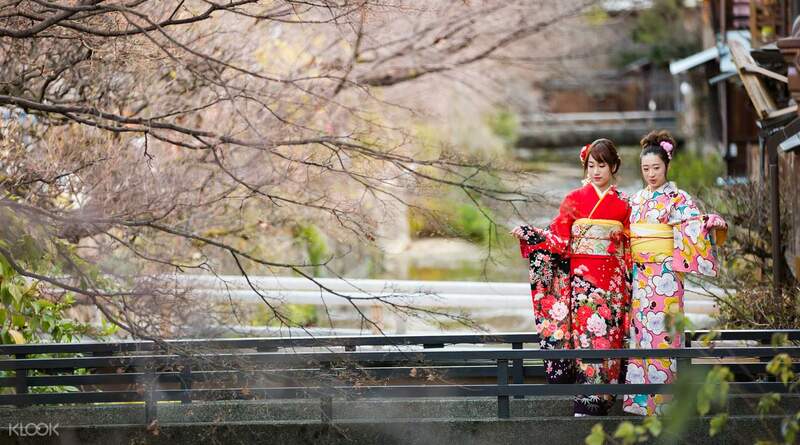 Traverse through the ancient city of Kyoto dressed the part in a traditional kimono. Enjoy the historical atmosphere as you walk around Gion district, the Fushimi Inari-Taisha shrine gates or countless of temples. Be awed by the variety of colors and patterns available for rent with helpful staff guiding you to create your dream look. Perfect the look with an intricate hairstyling service and accessories for a small fee. 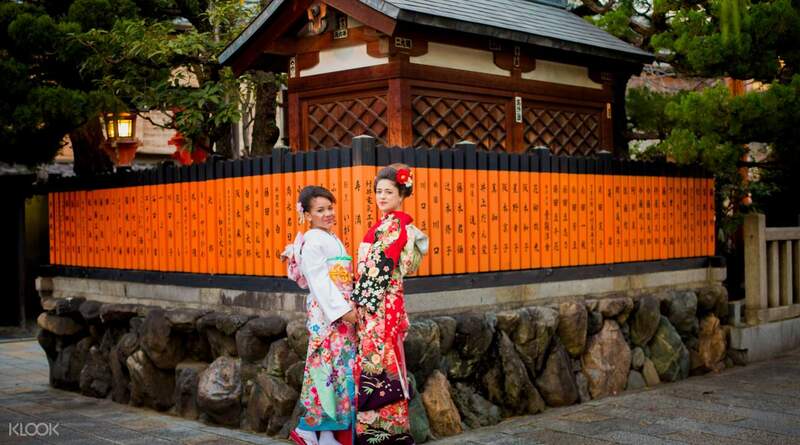 Roaming around Kyoto in a kimono with friends is a perfect way to enjoy and capture the natural beauty of the city! Great Experience! 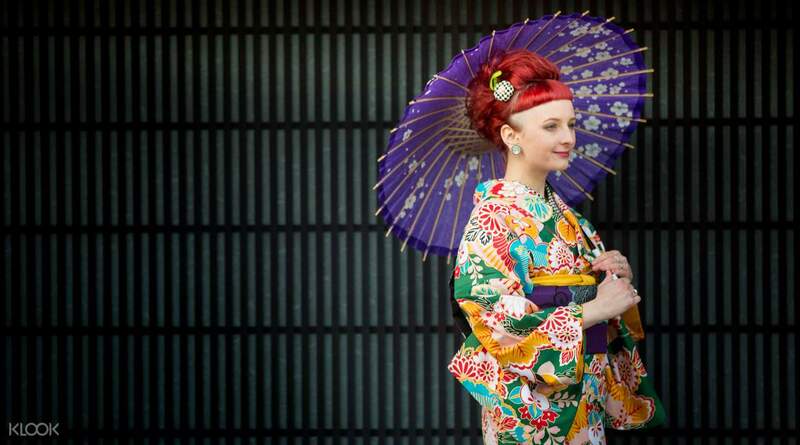 Suggest to get there as early as possible because you will need ample time to choose and wear your kimono. It will roughly take about 1 hour to complete the dressing, hair-do and changing of bag. Great Experience! Suggest to get there as early as possible because you will need ample time to choose and wear your kimono. It will roughly take about 1 hour to complete the dressing, hair-do and changing of bag. This is a fun experience! A must try whenever you visit Kyoto! It was a bit of effort, looking for the shop, since it’s not located in Kyoto tourist center, but hey, it’s still not that far! They have a very organized but kinda long process in getting and wearing the kimono/yukata, but still everything is worth it! Returning was easy, they didnt make it hard for us, they just asked us to leave it un any 7 eleven store, without paying anything. Cheapest rental rate so far! We’ll definitely do this again when we visit Kyoto! This is a fun experience! A must try whenever you visit Kyoto! It was a bit of effort, looking for the shop, since it’s not located in Kyoto tourist center, but hey, it’s still not that far! They have a very organized but kinda long process in getting and wearing the kimono/yukata, but still everything is worth it! Returning was easy, they didnt make it hard for us, they just asked us to leave it un any 7 eleven store, without paying anything. Cheapest rental rate so far! We’ll definitely do this again when we visit Kyoto! It was really fun! Despite of the typhoon, we didnt care less, we still went over it and we didnt regret it. Due to the typhoon, they made it easy for us to return the yukata, which was very convenient for us! They just asked us to leave it up n any 7 eleven store and pay nothing. They also let us move our schedule one day late, because we missed our original booking date. They have a smooth although long process in getting and wearing the yukata/kimono, but all ends well. They have the cheapest rental rate, since their shop is located a little outside the Kyoto tourists spots. We’ll definitely do this again. It was really fun! Despite of the typhoon, we didnt care less, we still went over it and we didnt regret it. Due to the typhoon, they made it easy for us to return the yukata, which was very convenient for us! They just asked us to leave it up n any 7 eleven store and pay nothing. They also let us move our schedule one day late, because we missed our original booking date. They have a smooth although long process in getting and wearing the yukata/kimono, but all ends well. They have the cheapest rental rate, since their shop is located a little outside the Kyoto tourists spots. We’ll definitely do this again. they open at around 9-10am so It is recommended that you be here early cause the Establishment have a long lines of customers but they are fast and everyone is nice and accomodating... putting the Kimono requires time and patience so pls do not be in such a hurry and just enjoy the experience... they have a lot of kimonos and accesories and you also had an option for makeup and hairstyle.. they open at around 9-10am so It is recommended that you be here early cause the Establishment have a long lines of customers but they are fast and everyone is nice and accomodating... putting the Kimono requires time and patience so pls do not be in such a hurry and just enjoy the experience... they have a lot of kimonos and accesories and you also had an option for makeup and hairstyle.. I super love the experience! The location is very near the subway station but if you wanna go to ninenzaka area it’s a bit far like 30mins walk. The queue isnt that long. The staff are very attentive. Love the experience! I super love the experience! The location is very near the subway station but if you wanna go to ninenzaka area it’s a bit far like 30mins walk. The queue isnt that long. The staff are very attentive. Love the experience! Great selection of kimono. Had a hard time choosing 😂 Hair accessories and coloured collars etc are optional at a fee. Staff was friendly, able to speak English or Chinese. Great selection of kimono. Had a hard time choosing 😂 Hair accessories and coloured collars etc are optional at a fee. Staff was friendly, able to speak English or Chinese. Booking was a breeze with Klook! Got there at my appointment time and the process was very systematic! Chose my kimono from a vast array of choices. Could also ask the staff for their opinion for colour! Next was fitting the Kimono, smooth and easy! Then hairdo, chose from 8 styles and just let them do their magic! Can buy 1 free 1 hair accessory to add on. Return was just as easy and all staff are friendly, helpful and warm! I booked a Tea Ceremony session nearby and wearing a beautiful Kimono definitely made my Japan trip even more memorable! Booking was a breeze with Klook! Got there at my appointment time and the process was very systematic! Chose my kimono from a vast array of choices. Could also ask the staff for their opinion for colour! Next was fitting the Kimono, smooth and easy! Then hairdo, chose from 8 styles and just let them do their magic! Can buy 1 free 1 hair accessory to add on. Return was just as easy and all staff are friendly, helpful and warm! I booked a Tea Ceremony session nearby and wearing a beautiful Kimono definitely made my Japan trip even more memorable! Q: Is the child price the same as the adult price? A: Yes. You can check the merchant's official website for the available kimono sizes. Please indicate the child’s height, gender and age at check out.